Fairy twirls when opened. 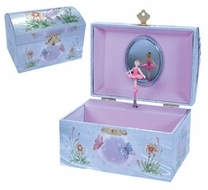 Box shimmers in light and plays "Swan Lake". Comes packaged in clear Pvc box. Ages 8+.